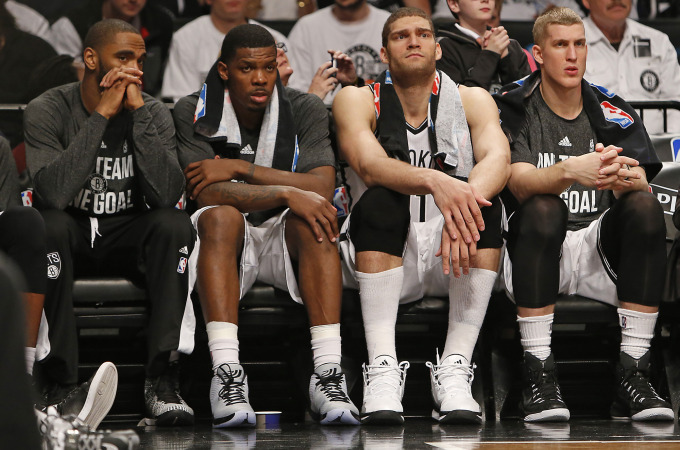 No single franchise in the entire NBA is in a worse position than the Brooklyn Nets. They had the highest payroll in the league this season at $87.8 million and just 38 wins to show for it. And they don’t even control their own first-round pick in this year’s draft. If Brook Lopez and Thaddeus Young decide to opt-out of their contracts next season and the Nets don’t retain either, they would still only be roughly seven million under the salary cap. The horrendous trade in the summer of 2013 with the Boston Celtics has been well documented. It’s one of the worst trades in NBA history. And as a result, the Nets do not have or control a first-round pick until the 2019 season. The Boston Celtics have their pick in 2016, the right to swap picks in 2017 and their pick in 2018. A 44-win season and a second-round beating at the hands of the Miami Heat was the sweet prize for that deal. The Atlanta Hawks have the right to swap picks this season thanks to the Joe Johnson trade. Since the Hawks have dealt their ‘franchise’ player, they’ve continued to make the playoffs and this year shocked everyone with a 60-win season. Since acquiring Johnson, the Nets have gotten progressively worse each season with 49, 44 and 38 wins in the three years he’s been with the team. If the Nets are lucky enough for Lopez to opt-out of his $16.7 million next year they should send all of his calls directly the voice mail should he call to seek a multi-year contract. He’s had constant foot problems the past four years and in two of those seasons he played five games and seventeen games respectively. And along with his nagging injuries, he’s just not that good a player. Paying $17+ million to a player who can’t defend, can’t rebound and is always injured is an awful idea. I don’t care how bad you are or how many draft picks you don’t have. It doesn’t mean you waste money on a player just so you’re not completely pathetic. Clearing cap space should be this team’s ONLY goal the next few seasons. Otherwise they’ll stay in the 35-to-40 win range for another five seasons. I’ve always liked Thad Young as an all-around player but overpaying is something they need to avoid should he opt-out of his $9.7 million contract next season. Three-years, $30 million is probably the most I’d offer Young if I were Billy King. This isn’t an all-star caliber player here, he’s a nice piece to have. That’s about it. What the Nets have to look forward to is Johnson’s contract having only one year left and Deron Williams having two years left. There isn’t anything they’ll be able to do with Williams’ contract, not at least until his final year, but they should shop Johnson next January to anyone that’s even somewhat in contention and try to get a first-round pick in return. And then try the same thing with Williams the season after that. The only way to get out of this mess is to strip down to the bear bones like the New York Knicks did this season. I understand they don’t have their own pick until 2019 so they wouldn’t even benefit via the draft from being a bad team, but it doesn’t mean you should continue adding awful salaries either. In fact, should they let both Lopez and Young walk this off-season and let Johnson’s contract expire or don’t bring back a contract that goes beyond the 2015-16 season, the Nets can have a salary cap of as little as $25.9 million for the 2016-17 season or as much as $38 million should they pick up all the team options should they choose. And that includes the $22.3 million owed to Williams. The 2016-17 off-season is the time where the cap is expected to jump all the way up to $101 million, so the Nets could be looking at something in the range of 63 to 76 million in cap space that summer. And that’s just one summer away. Isn’t that much better than being locked into another bad Brook Lopez contract?